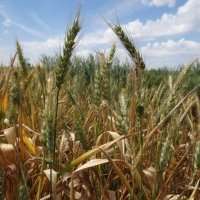 Plant biologists from The University of Western Australia have made an important discovery about rising temperatures and wheat crops—and subsequently learned that the Romans suspected the effect more than 2000 years ago. The study, published in Scientific Reports, revealed what happens when wheat plants cannot get enough oxygen because of flooding. The scientists found the wheat was more susceptible to damage from flooding as the temperature got warmer—only to later read a Roman farming handbook that hinted at the same effect. De Agri Cultura, believed to be written by Cato the Elder in 160 BC, suggests rainfall can be left on wheat fields through the cold part of winter but will damage the crops if not removed by spring. Lead researcher Dr. Shaobai Huang from the ARC Centre of Excellence in Plant Energy Biology at UWA said the study looked at what different types of wheat plants make inside their cells to help them cope with a lack of oxygen. "We tested the plants at 15°C to 28°C, and we found a dramatic negative impact on how well wheat plants recovered from a lack of oxygen under the higher temperatures," Dr. Huang said. "Not only is temperature arguably more important than the type of wheat, but small temperature changes can make a huge difference. "At 20°C they were fine but at 24°C they suffered really badly." ARC Centre of Excellence in Plant Energy Biology Director at UWA, Professor Harvey Millar, said climate change was poised to deliver a double blow to wheat plants, with both increasing temperatures and a greater chance of flooding. "This research shows that we don't need temperatures to rise at the hottest part of the year to have a big impact on our crops," Professor Millar said. "It might just be the difference between having a cool spring or a warm spring." But Professor Millar said being able to understand the mechanism inside wheat cells that is behind the 2000-year-old agricultural advice offered new hope to farmers. "The Romans knew the problem but they didn't have any way to try and find a solution, other than to drain the field" he said. "Today we now know that amino acids play an important role in how plants respond to a lack of oxygen. "Based on this new research we may be able to come up with a breeding solution, because after 2000 years we finally understand the mechanism behind the damage to wheat."